Home › Barack Obama › Will Obama launch a drone attack on himself? Will Obama launch a drone attack on himself? If you look at history you will see example after another of leaders of countries, or gangs, or religious groups killing their own people over and over again. Why is it that citizens are told to solve their problems non-violently or face prison but governments continuously LOOK for opportunities to kill people with impunity? Did you know Barack Obama has executed at least 3 Americans that were not found guilty of any crime? Do you know why he had them killed? In 2011 if you were an American and the White House said you were a terrorist then you were marked for death. This is what happened to Anwar al-Aulaqi and others. He was an American living in Yemen who “allegedly” supported Al-Qaeda. Obama has ordered the killing of at least three Americans including Anwar al-Aulaqi using remote controlled drones. 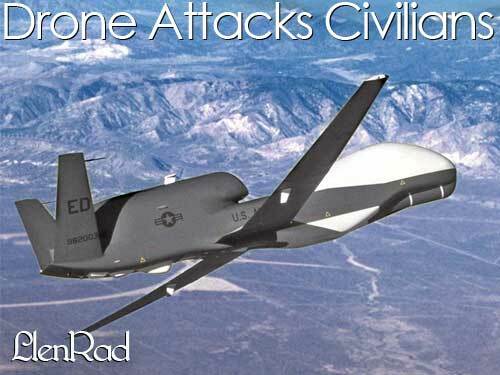 These drones have been bombing people accused of helping Al-Qaeda “terrorists” at an alarming rate. IN 2012 DRONE STRIKES ARE EVERYWHERE: Obama has launched more drone attacks in Pakistan since 2009 than in all the years prior combined. YEMEN drone strikes killed three Americans. In Afghanistan Obama doubled the number of drone strikes. Drone strikes are killing people in Somalia including a Britain who was accused of supporting Al-Qaeda. There have also been drone strikes in The Philippines, Ethiopia, Central America, and even the Caribbean islands. This is a pretty clear “policy” that says if you support Al-Qaeda then drones will be coming your way and just like Obama joked you won’t even hear them coming. My questions is what happens when Obama is the supporter of Syrian rebels and the rebels are in fact Al-Qaeda fighters? Doesn’t this mean that he, the commander in cheif is in fact an Al-Qaeda supporter? Based on his own policy hasn’t he made himself a target of his own drones? What about Britain should the UK get attacked by a drone for supporting the Syrian/Al-Qaeda rebels too? Why is Russia exempt from bombing when they openly support Assad and Syria? Have you heard about the atrocities the terrorists are committing? Who is responsible? If Romney is elected do you think things will get better or worse? Thanks for reading my article and sharing or commenting. Why your online business plan is the pathway to success. How to Get CDL qualified without trucking school. Thanks for Reading. Did you know when you SHARE or COMMENT you get more followers? Check out my latest projects: Progression of a Sellout - Closed Sourced Morals. What kind of person is a corporation? Vivienne Harr: When life gives you lemons sell lemonade and end slavery. Harvard: Fluoride makes you dumb. LIBYA: Is this a story of the snake and the frog? Obama admits his support for Al Qaeda, do you? 3 reasons why legendary super trendy Bob Costus wants Americans Unarmed. Why Black Politicians Emulate The Rulers of their Fathers.